Designed for use with the company’s high-end OM-D Micro Four Thirds cameras, the speedy f1.8 8mm fisheye offers a 35mm equivalent view of 16mm, while the 7-14mm covers an equivalent focal length range of 14-28mm. As befits their ‘pro’ rating, the lenses come with a fairly hefty price tag, with the 8mm retailing for £799.99, and the 7-14mm selling for £999.99. Professional-grade Olympus lens range expands again with world’s brightest* Fisheye lens and a fast ultra wide-angle zoom lens plus a new underwater accessory. Southend, 12 May 2015 – Olympus has added two new professional-level Micro Four Thirds lenses to its rapidly expanding M.ZUIKO PRO flagship range: the extremely bright M.ZUIKO DIGITAL ED 8mm Fisheye 1:1.8 PRO and the M.ZUIKO DIGITAL ED 7-14mm 1:2.8 PRO. Considering the Micro Four Thirds crop factor of 2x, this new duo means the M.ZUIKO PRO family now offers professional and semi-pro photographers, as well as ambitious enthusiasts, five dedicated lenses for the entire focal range – from 14mm super wide angle to 300mm super telephoto in the 35mm equivalent. The world’s brightest fisheye lens*, the M.ZUIKO DIGITAL ED 8mm Fisheye 1:1.8 PRO will retail for £799.99 while the M.ZUIKO DIGITAL ED 7-14mm 1:2.8 PRO will cost £999.99. Both lenses are available from June 2015.
compact Micro Four Thirds camera bodies, they can put together a fully equipped system that could weigh just half of the equivalent kit for a DSLR. Together with these two new lenses, Olympus is introducing a new accessory for advanced underwater photography with the M.ZUIKO Digital ED 8mm Fisheye 1:1.8 PRO. The extremely compact PPO-EP02 Dome Port perfectly matches the size of the new Fisheye lens, and it’s dedicated optical design brings out the lenses best macro performance, even underwater. This new accessory will retail for £699.99 from July 2015. The two new additions to the award-winning M.ZUIKO PRO series mean photographers now have an optically outstanding, compact and lightweight lens option for every bandwidth along the focal length range from wide-angle to super telephoto. M.ZUIKO PRO lenses are ideal for fast-moving, spontaneous shooting styles and are fast becoming the go-to brand for professional and semi-pro Micro Four Thirds owners looking to complete a comprehensive, high-quality lens line-up – as well as current DSLR users who need a more practical, more mobile and inconspicuous alternative to unwieldy cameras and heavy kit bags. Apart from being fully weatherproof, all M.ZUIKO PRO lenses are equipped with Olympus cutting-edge thin ZERO coating*** technology that keeps ghosts and flares to a minimum. Moreover, the extraordinary strength of this coating also prevents scratches and maintains the lens’ stable low-refractive performance. That success was followed by the first telephoto zoom, the M.ZUIKO DIGITAL ED 40-150mm 1:2.8 PRO zoom lens, that is likewise more compact and lighter than a typical APS-C or full-frame lens with comparable characteristics and scope of performance. Its unrivalled DUAL VCM focussing system made it another PRO world-record holder – it’s the first system to power two high-grade lens elements using dual linear motors, which makes it beautifully quick and quiet when you’re shooting wildlife, people and other camera-shy, potentially fast-moving subjects. The new splash and dustproof M.ZUIKO DIGITAL ED 7-14mm 1:2.8 PRO is the first wide-angle zoom lens in the M.ZUIKO PRO series. 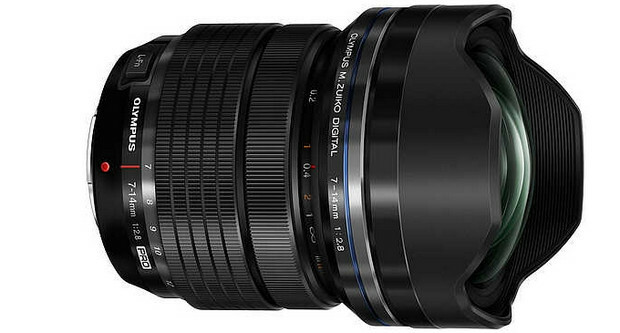 It inherits both the compact and lightweight M.ZUIKO PRO design as well as the optical fireworks. Like the new Fisheye PRO, the 7-14mm wide-angle zoom lens guarantees excellent optical performance quality from edge to edge. For example, with starscapes, it reproduces stars as circular points of light, even on the periphery of the frame. It’s also packed with practical PRO features, such as the manual focus clutch that lets you instantly switch from AF to MF by pulling the focus ring toward the camera body. There’s also an L-Fn button on the base of the lens that lets you make changes in an instant with your thumb – to one of your preferred pre-assignable settings. Like the rest of the PRO family, this versatile and fast-focusing newcomer is fully weatherproof – thanks to 11 separate seals – and it’s out in the field that the wide-angle zoom comes into its own. It lets you get just 7.5cm from your subject (measured from the end of the lens), which is about 20% closer than equivalent rivals. Of course, the depth of field makes for excellent wideangle backgrounds. 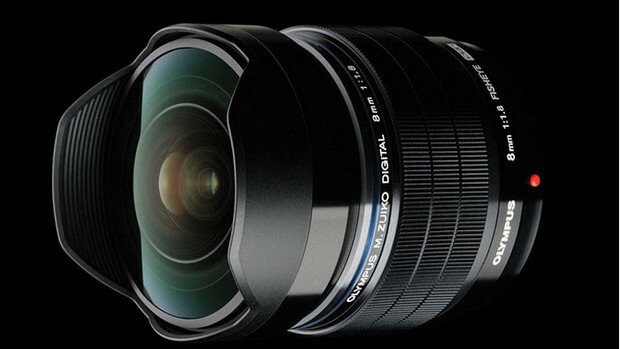 The M.ZUIKO DIGITAL ED 7-14mm 1:2.8 PRO weighs just over half as much as equivalent 1:2.8 aperture rivals, so it’s perfect for spontaneous hand-held shooting, by day or at night. The combination with OM-D powerful in-body image stabilization ensures even wide angle shots come out sharp and clear. From under the sea to the night sky, the record-breaking new M.ZUIKO DIGITAL ED 8mm Fisheye 1:1.8 PRO is an unprecedented opportunity to add stand-out creativity and a uniquely dynamic and abstract look to extremely wide-angle shots of the natural world. Unprecedented, because – in this category – the Fisheye PRO is the world’s brightest fisheye lens*. The super-large aperture ensures photographers top-notch optical performance in any conditions, especially in low light. The 2.5-cm minimum focusing distance (measured from end of the lens) and maximum magnification of x0.2 make it a logical choice for nature photographers with a passion for quirky perspectives and eye-catching bokeh. But the Fisheye PRO is also ideal for fast-action sports photography; landscape, nightscape and sky panoramas; as well as crowds, interiors or architecture. For underwater specialists, it likewise opens up exciting new opportunities – it’s compatible with a range of accessories via the new underwater lens port PPO-EP02. For the full list of the M.ZUIKO DIGITAL PRO series, lens features and accessories, go to Olympus ZUIKO section on the website. For more information about Olympus underwater accessories go to the dedicated Underwater Section of Olympus website. • Olympus PPO-EP02 Dome Port is priced at £699.99 RRP inc VAT and available from July 2015.